*Service currently only available in Kenya. More countries coming soon! We will send you an sms with a link to click. This will check your internet settings and automatically detect your phone model for compatibility with anwane. The webpage will give you the status of the registration process. If the registration process is successful, you will receive 2 sms's. The 1st sms is an instructional sms that shows you how to get to the synchronization menu, it also provides you with your username which also acts as your email address. The 2nd sms will be a configuration sms, this will automatically setup your phone for synchronization. The PIN for installing the settings is 1234. 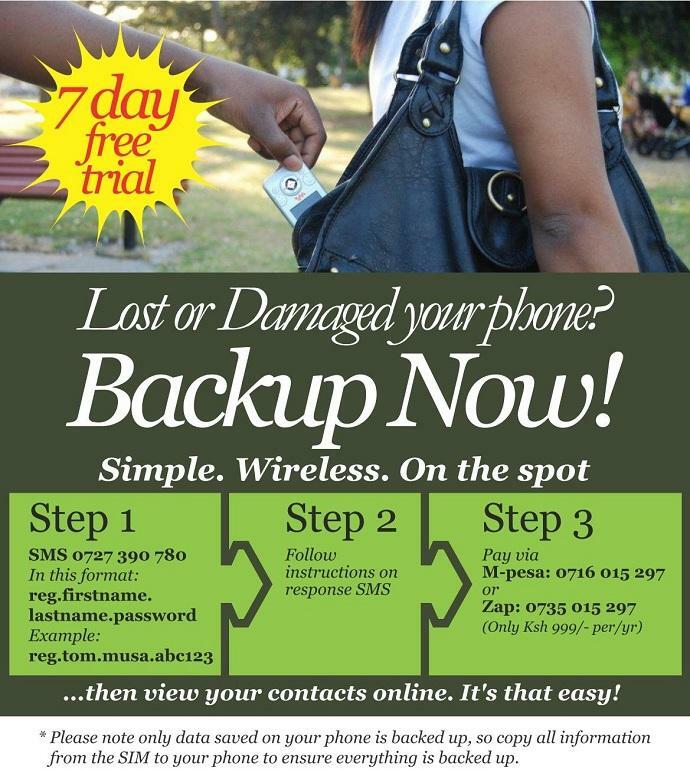 Your can now backup your phone, it's FREE TO TRY for 7 days. To activate your account for 1yr, Send Ksh.999/- payment to Mpesa: 0716015297 or Zap: 0735015297 before the trial period expires. You will receive confirmation via sms once your account is activated. To backup your data, locate the sync menu from the sms received in step 2 and follow the prompts.That's it! Ensure the backup process says "completed successfully" to make sure all your data is backed up ok. Note! Only data saved on your phone is backed up, so copy everything from your SIM to your phone to ensure everything is backed up. You can now access & manage your data anytime by logging into your online personal account from anywhere in the world...all you need is internet access. Anwane...Peace of Mind!